Squarespace provides a wonderful website service to churches, businesses, and even individuals. Even though you can design Squarespace websites down to the smallest detail, they still remain an extremely easy platform to add/edit content on your website. However, no matter how quick it can be, sometimes things don't seem easy the first time you do it. I've been asked on how to do many things on Squarespace so I thought I would post some of them as a resource for others to easily find and read though. This article explains how to add pictures to your Squarespace website. This is specifically helpful for blogging, though it's the same though out all the website design as well. To being, there are two main types of photos we'll be covering, however, for both options, you first have to add a new "content block". Do so by going to the left side of the content area and you’ll see a black line with a bubble on the left hand side. Click the bubble. The first option we'll cover is to add individual photos. This is a good option to place one or two photos in a blog post, or somewhere on your Squarespace website. After clicking the bubble on the left to show the content block options, you then click on the "Image Block" found in the top right. After clicking “image", you can add an image by either dragging and dropping your image, or by clicking "add an image" to browse your computer's file structure. 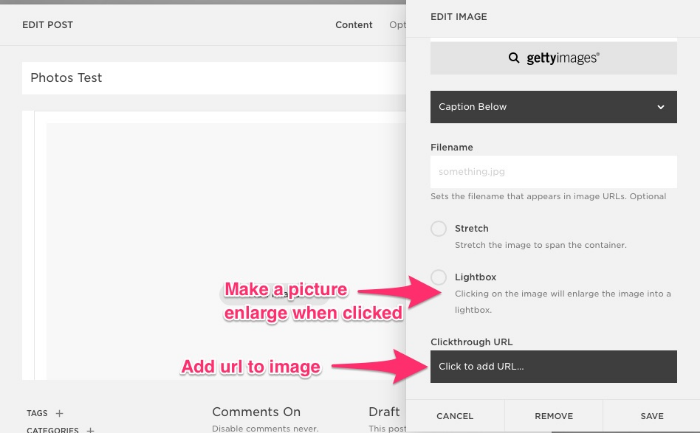 Additionally, you can change the caption, enable Lightbox mode (where the image will go fullscreen when clicked), or even add a url to the image that will redirect your website visitor to a different webpage when clicked. Some of these options require you to scroll down in this popup window to get to them. This option is great for single images that you want to arrange in a particular fashion or if you only have a few. However, if you are wanting to do many images at one time for a photo album of sorts, this would be extremely tedious, so if you have multiple images that you want to display in a variety of ways, there’s a second option called a gallery. After clicking the bubble on the left to add a Squarespace content block, you will find an entire row dedicated to the multiple gallery options just below where we clicked for an "Image" block in the previous section. Note: There are multiple gallery options. Once you've chosen a gallery you can change which style you want later so the initial decision doesn't have to be final. Once you choose a Squarespace gallery option, you can upload any pictures you want in bulk or one at a time by using the same drag and drop method, or the "add an image" button to browse your computer's file structure as before. Once the photos are uploaded you can adjust the Name, Description, and URL of each picture under their settings option, or you can edit each picture using Squarespace's built in photo editor. After doing that (if you so choose), you can click the “Design” tab on the top right and set more preferences on how the overall gallery looks. At the top you can change whether it’s a Slideshow, Carousel, Grid or Stacked layout. Each layout will provide different options on how the images transition, the padding between images, or the number of images per row, etc. I hope all of this was helpful. If you can think of any specific questions on editing Squarespace Websites that you would like me to write about, please say so in the comments below. Or if you're in need of someone to design your Squarespace website, feel free to contact me about it.